The sloping 450 metre long grass airstrip clinging to the side of a mountain disappeared behind us along with the Mangao aid post. 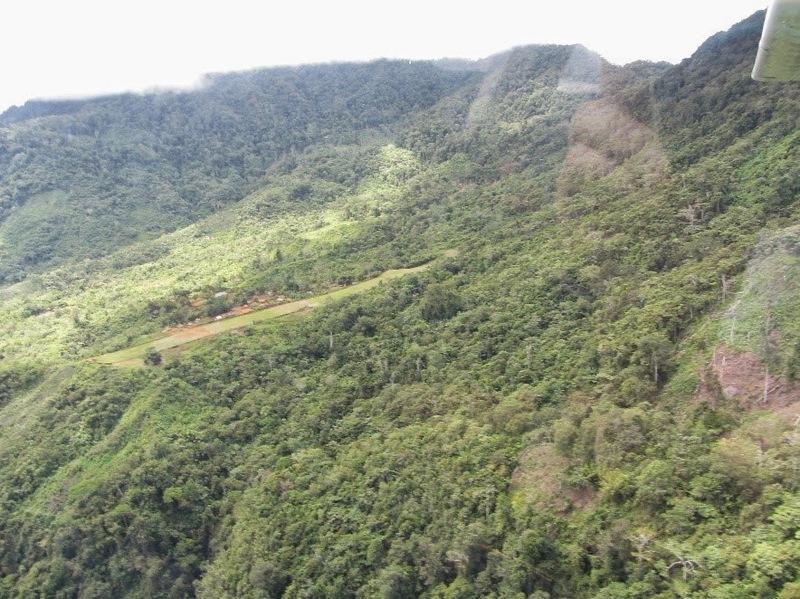 Our 20 minute flight back home took us over lush green river valleys, dense rainforests and isolated villages; we skimmed across the tops of mountain ranges within what seemed like touching distance. As we looked out the window and watched the plane’s tiny shadow ringed with a rainbow on the dense bush below, we marvelled at the ease of this journey from above, but were at the same time struck by how difficult it must be for the thousands of villagers living scattered in the bush below, who have no roads and no easy way out. 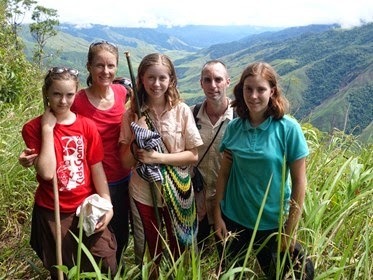 Our family lives at Kompiam Hospital in Enga Province, Papua New Guinea. We are involved with administration in the hospital and teaching at the hospital school (Kompiam International School). In July this year, we spent a week at Mangao, one of the hospital’s 10 remote aid posts and health centres that serve as the only health facilities for a large portion of Enga Province, meeting the health needs of between 50,000 – 60,000 people. It was an eye-opening experience to see just how remote this part of PNG is and how the people live in these areas. No roads. No phones. No power. No infrastructure or proper facilities such as schools and health care. Even the radio at the aid post was broken while we were there and we had no link with the outside world. Our brief experience over these few days served to highlight the incredible work done by Mission Aviation Fellowship (MAF) within this region, throughout PNG, and in many other countries of the world. 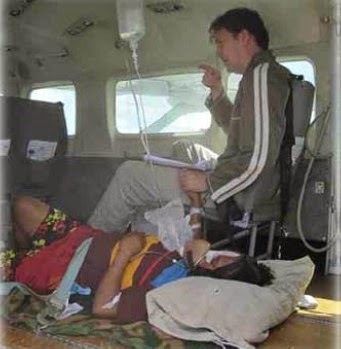 We have seen MAF in action for the last few years living here in Kompiam, with several flights each week to and from the hospital from our remote aid posts. Patients include the critically ill, pregnant mothers, sick children, tribal and domestic injuries, TB, HIV, Malaria, and the list goes on. However, it wasn’t until we made this trip ourselves with MAF that we truly started to see how critical this service is to the lives of people living in these remote areas with no real access to proper health services. For a pregnant mother with complications, or a man with serious back injuries after falling out of a tree, there is little chance of making the gruelling 3-4 day walk from Mangao to the hospital here at Kompiam. MAF is the only option for these patients, as well as the only way in which the hospital is able to run and support our remote health services. It is only in conjunction with MAF that the Kompiam Hospital, and so many others just like it around the world, are able to function effectively and bring essential services and hope to people living in these very remote locations. But MAF, like many mission organisations, needs the help of people around the world in order to be able to effectively function and do what they do. Here in PNG for example, MAF are struggling to get enough pilots, engineers and other ground staff to maintain their services. Funding is also an ongoing battle as MAF provides significant discounts for flights supporting the local churches, as well as for educational development, health, and especially medical evacuation flights. So our family along with the kids of the Kompiam International School have decided to dedicate the month of November to an MAF Prayer Marathon. Our airstrip here at Kompiam is about 800m long (half a mile) and we propose to get as many people as possible to run 1 mile (up and back down the airstrip) 26 times in the month of November – yes, that is equivalent to a marathon. What we are asking of you is also a small daily commitment during the month of November. It’s simple - we run a marathon - you pray a marathon. We would like you to sponsor us through prayer for MAF on a daily basis as you follow our marathon progress. 4. Start praying for MAF now. Thanks for the update, guys. You will definitely have our support in prayer!